Transurethral resection of a bladder tumour (TURBT) is an operation used to diagnose and treat early bladder cancer. During the procedure your surgeon cuts away any abnormal growths (tumours) in your bladder. These are tested there and then to see if they are cancerous and, if they are, how advanced the cancer is. If the tumour is on the lining of your bladder and hasn’t grown into the surrounding muscle (non-muscle invasive), then TURBT can be an effective treatment. About eight out of 10 people with bladder cancer have the non-muscle invasive type and so, may be offered TURBT as a treatment. After the procedure, you’re likely to be given medicine that goes straight into your bladder. This is usually chemotherapy, which helps reduce the chance of the cancer coming back. This information can help you understand the pros and cons of having transurethral resection of a bladder tumour. Think about how important each issue is to you, and then talk to your surgeon. You can work together to decide what's right for you. Your decision will be based on your surgeon’s expert opinion and your personal values and preferences. TURBT can be used to diagnose and treat bladder cancer during the same procedure. If the tumour is on the lining of your bladder and hasn’t spread to surrounding muscle (non-muscle invasive), then TURBT can be an effective treatment. TURBT doesn’t always get rid of all cancer cells. The cancer may come back, and you may need to have other treatment. You may need to be in hospital for a few days, and it can take up to two weeks to fully recover from your operation. Although how long you need to stay in hospital will depend on the size and nature of the tumour. You’ll need to have a cystoscopy a few months after your TURBT to check how well the procedure went. You’ll meet the surgeon carrying out your procedure to discuss your care. It may differ from what is described here as it will be designed to meet your individual needs. You’ll probably need to stay in hospital for up to three days, but this can vary depending on the size and nature of your tumour. The larger and more aggressive the tumour, the longer you may need to stay in hospital after TURBT. It’s a good idea to arrange for someone to take care of any important tasks you would normally have to do, such as taking care of pets or any carers’ responsibilities. Your surgeon will explain how to prepare for your procedure. For example, if you smoke, you’ll be asked to stop, as smoking increases your risk of getting a chest and wound infection, which can slow your recovery. Smoking is also one of the main causes of bladder cancer, so, stopping now may help to stop the cancer from coming back. You’ll have a general anaesthetic or a spinal anaesthetic. For a general anaesthetic you’ll be asleep throughout the operation. For a spinal anaesthetic you’ll be awake, but you’ll feel numb from the waist down. Having an anaesthetic can make you sick so it's important that you don't eat anything for six hours before your operation. You may be able to drink up to two hours before your surgery, but your anaesthetist or doctor will tell you what you need to do. If you have any questions, just ask. At the hospital, your nurse will check your heart rate and blood pressure, and they may also test your urine. You may be asked to wear compression stockings to help prevent blood clots forming in the veins in your legs. You may also need to have an injection of an anti-clotting medicine as well as, or instead of, wearing compression stockings. Your nurse or surgeon will discuss with you what will happen before, including any pain you might have. If you’re unsure about anything, ask. No question is too small. Being fully informed will help you feel more at ease and will allow you to give your consent for the procedure to go ahead. You’ll be asked to do this by signing a consent form. Urine tests to rule out a urine infection and to see whether there are any cancer cells. Cystoscopy can be used to diagnose bladder cancer. This is a procedure to look inside your bladder and take tissue samples (biopsies). Your surgeon will put a thin tube with a light and camera on the end into your bladder through your urethra (the tube where your urine comes out). Small tumours may be removed as part of the biopsy or your surgeon may schedule a TURBT to remove the tumour afterwards. A CT scan or MRI scan can help to diagnose bladder cancer, and show what type it is and whether it has spread outside the bladder. If your cancer has grown into the muscle of your bladder, or has spread outside your bladder, your doctor may suggest other treatments. These include an operation to remove all or part of your bladder, radiotherapy and chemotherapy. Talk to your doctor for more information. Depending on how many tumours you have and how big they are, the operation can take between 15 minutes and one and a half hours. Before the operation starts, you’ll probably be given antibiotics via a drip or straight into your vein. Your surgeon will put a cystoscope (a thin, tube-like telescope) into your urethra – the tube where urine comes out of your body. The cystoscope is then passed up into your bladder. A camera lens at the end of the cystoscope sends pictures from the inside of your bladder to a monitor, where your surgeon can see them. Your bladder is inflated with fluid during the procedure. Your surgeon then uses special instruments, which use heat or a laser, to shave the tumours off the inside of your bladder. The heat or the laser also stops any bleeding when the tumours are removed. Your surgeon will also remove some deeper tissue as well, to check whether the cancer has spread into the muscle. These tissue samples are sent to the laboratory for testing. Your surgeon then takes the cystoscope out and passes a thin, flexible tube (catheter) into your urethra. This lets your urine drain into a bag. The catheter is sometimes used to flush your bladder with liquid after your operation, which stops blood clots from forming. Your surgeon will also put chemotherapy medicine into your bladder through the catheter. This goes in straight after the operation and stays in your bladder for an hour before it’s allowed to drain out. Looking for cancer cover that supports you every step of the way? You’ll need to rest until the effects of your anaesthetic have worn off. There are medicines available to ease any pain or discomfort you may have. You may need to keep wearing compression stockings to keep your blood flowing. Getting out of bed and moving around is a good idea. You may not feel like it, but it will help prevent other problems later, such as blood clots in your legs or lungs. Having a general anaesthetic can really take it out of you. You might find that you're not so coordinated or that it's difficult to think clearly. This should pass within 24 hours. In the meantime, don't drive, drink alcohol, operate machinery or sign anything important. You might see some blood in your urine. This is normal after a TURBT. When you’re able to, make sure you drink plenty of fluids (around eight glasses or 2 litres each day). This helps to flush out your bladder regularly, which stops blood clots forming and makes passing urine more comfortable. If there’s a risk of bleeding after the procedure, you may also have large bags of fluid connected to the catheter to flush out your bladder until the bleeding stops. After your catheter is taken out you might find it uncomfortable to pass urine. You may have a burning feeling when you pee, and find you need to go urgently or more often. These symptoms usually get better in a few days, but if they don’t, see your doctor. Before you leave hospital, you’ll be given a date for a follow-up appointment to talk about the results from your surgery. You’ll need to arrange for someone to drive you home. And if you can, have a friend or relative stay with you for the first 24 hours or so. You may feel tired and washed out for a few days after your operation. If you need pain relief, you can take over-the-counter painkillers such as paracetamol or ibuprofen. Always read the patient information leaflet that comes with your medicine and, if you have any questions, ask your pharmacist for advice. Some people go back to their usual activities in a few days, whereas for others it can take up to two weeks to feel fully back to normal after TURBT. Ask your surgeon about when you can go back to work. It’s normal to get some bleeding from your urethra, or see some blood in your urine, for up to three weeks after your operation. However, if you have large blood clots and these stop you passing urine, you should speak to your surgeon straightaway, or go to your local accident and emergency. If you have any of the following symptoms, you should see your GP, as they could mean you have a urine infection. This is common after TURBT, so it’s important to be aware of the symptoms. Feeling like you need to pee urgently and often, or when you’ve just been. Pain or discomfort when you’re passing urine. Constant lower abdominal (tummy) ache. Feeling generally unwell, such as aching all over, feeling sick, tiredness and cold sweats. There are things that you can do at home to make sure you fully recover and heal well. Drink plenty of fluids – eight glasses or around 2 litres each day. Take any antibiotics you were given after your operation. Don’t drive until you feel comfortable. If you’re in any doubt as to whether it’s alright to drive, check with your insurance provider. Some people have another TURBT a few weeks or months after the first one. This is to check whether there are any signs of further cancer and to remove any more tumours. You may also need to have more chemotherapy put directly into your bladder after a TURBT. Your surgeon will monitor you going forward. They’ll arrange for you to have a cystoscopy about three months after your TURBT. You’ll be asked to have regular cystoscopies after that. How often you need these will depend on how likely the cancer is to come back. It will probably be between once every three months and once a year. Complications are when problems occur during or after your procedure. The possible complications or risks of any operation include an unexpected reaction to the anaesthetic or developing a blood clot in your leg (deep vein thrombosis). Possible complications of TURBT are outlined below, with the most common complications listed first. We haven’t included the chances of these happening, as they are specific to you and differ for every person. If you’d like more information about complications and how they might affect you, speak to your doctor. And be sure to tell them immediately if you think you have any of the following. Urine infection. 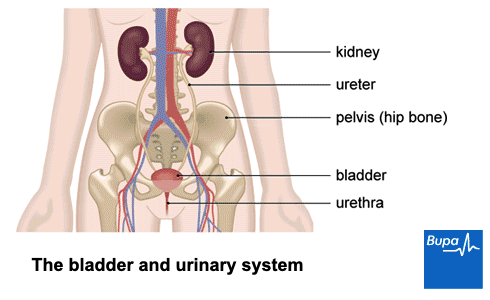 Bacteria can get into your urethra and bladder (your urinary tract) and cause infection. This can happen either during the operation or afterwards when a catheter is put in. The symptoms of a urine infection include feeling like you need to pee urgently and often, pain or discomfort when you’re passing urine, and smelly and cloudy urine. All of the cancer might not be removed, or the cancer might come back. You’ll have regular check-ups after your TURBT, and if there is any sign of cancer, you’ll be offered more treatment. Bleeding. Sometimes the bleeding after your operation doesn’t stop naturally, and blood clots can form. You might need an operation to stop the bleeding and take out the blood clots. Large blood clots can stop you passing urine, so if this happens speak to your surgeon straightaway, or go to accident and emergency. Small holes made in your bladder wall during the operation. This is called perforation. If this happens, your catheter might need to stay in for longer than usual. If the hole is large, you may need an operation to fix it. What happens if I don't want to have TURBT? What happens if I don't want to have TURBT? Any decision to have a test or treatment, or not, is yours to make. However, it’s important to make sure you understand what the procedure is for, what the alternatives are and what could happen if you choose to say no. You can talk to your surgeon, ask questions and ask for more information if you need it. You might find it helpful to talk to your family too, or hear what people who have had the procedure have to say. You can always ask for more time to decide about the treatment if you feel you need it. TURBT is the main way of diagnosing and treating non-muscle invasive bladder cancer. There are alternative ways to diagnose bladder cancer but they aren’t as reliable (there’s more information about these in the Alternatives section above). There are other treatments for bladder cancer too. Although these are usually for cancer that has grown into the muscle wall of your bladder, or cancer that has spread further. Bladder cancer is an uncontrolled growth of cells lining your bladder wall. Map of Medicine. Bladder cancer. International View. London: Map of Medicine; 2016 (Issue 3).